Fruitless Pursuits: Review: Les Miserables! A complete stranger to the musical, the book, musicals, and reading, I approach director Tom Hooper's 2012 adaptation of Les Miserables as a dutiful boyfriend, making up for eight years of often sketchy superhero fare. As the lights dimmed I braced myself for a three-hour all-singing trial disappointingly devoid of mutants, catwomen, warg riders or giant eagles. And yet, by the time the lights returned, I was pleasantly surprised. Maybe even a convert. And I may have even had, at times, just the tiniest, most discreet, manliest bit of a cry. I was having a great time being miserable. This is what Hugh Jackman looks like when you see him begging for cigarettes at Sydney's Redfern Station. Although it's not all perfect. To find out what worked for me, and what didn't... join me after the jump! If you're a noob like me then you may not know that Les Miserables is about The Miserable Ones, specifically the incredibly miserable Jean Valjean, a convict who once stole a loaf of bread and, having finally paid for his crimes, breaks his eternal parole to start a new life. He is portrayed by Australia's golden child, Hugh "Wolverine"Jackman who is so bleary-eyed in parts of this film that he looks like Don Cheadle. Meanwhile Javert, a doggedly determined police inspector is determined to spend the oncoming decades hunting down Valjean to bring him to justice. Javert is portrayed by Australia's own Russell "No, honest, he's actually from New Zealand" Crowe who, at times, looks like he'd rather be at the pub. Complicate matters with Anne Hathaway's long-suffering factory worker, a lost little girl, two opportunistic inn-keepers, a sweeping love story and the seeds of revolution and there's an awful lot for everyone to sing about. And it seems to be the singing that has split the Les Mis audience. Singing in films, in my experience, is usually dubbed (The Muppet Movie? Not actually singing), but director Tom Hooper insisted that everyone sing their songs live during filming in order to keep the mountains of emotion raw and real. And this doesn't work for everyone. And this is where Hooper is in one of those unwinnable situations that often stems from adapting a beloved work. As I said in my recent Top Ten Favourite Films of 2012 fans are great, but fans love things so much that they feel like they OWN them. And fans usually feel like they know more about the property than the person adapting it. And it's true that they often do, but I would argue that that kind of knowledge is more useful for making wikis than it is for creating art. So I have read criticisms such as the recent twitter exchange where an American Idol contestant criticised the film for showcasing actors pretending to be singers. And I'm sure that there are both singers and fans of Les Mis that would prefer more polish on the songs at the expense of the performances. I can't share that opinion. For me, Tom Hooper's choice is the triumph of the movie. The story is solid enough and genuinely gripped me at times (especially the first half) and had my mind wandering at others, but it is the outstanding performances that made this a memorable film for me. Hooper's work is real and raw, and even when characters are required to switch emotions/motivations in a second, the actors - for the most part- bring so much gusto and conviction that I couldn't help but be absorbed. 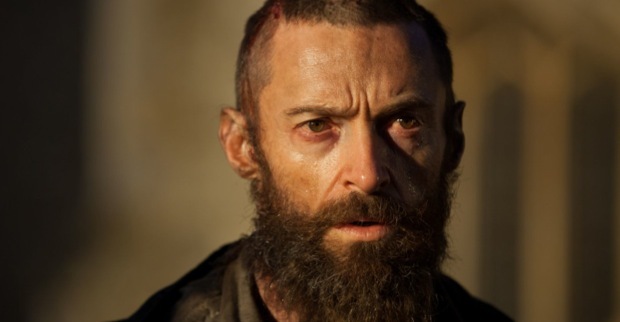 When Hugh Jackman's Valjean makes an early decision to alter his life's destructive course, I completely understood, and had empathy for, his passion and devotion. I've always been a fan of his work but have never seen that kind of intensity in his eyes, and to know that he was belting out that song live, and imbuing every phrase with unrestrained emotion and meaning made it surprisingly moving for me. As a newcomer, he completely sells that character's arc for me and I am on his side. And then Anne Hathaway steals the show. She suffers appallingly and when she is finally broken and alone and sings of all her fears and crushed dreams in that one, long, close-up shot, she pulls off a feat that I was truly unprepared for. I agree that the performers rarely blow the roof off with their singing but I would much rather see this "actor pretending to be a singer" and would rather hear her spit quavering lines through tears and snot, and to feel for everything she has endured, than trade any of that for a singer dubbed. Hathaway is the real deal. If she doesn't win an award I will make her an award and post it to her. But not everyone rises to the occasion. Russell Crowe naturally has a strong presence and I think he has a good look and feel for the part of police inspector, Javert, but he fails to deliver a performance that matches his colleagues. And it's not even about his singing for me, it's his lack of passion. As the counterpart to Jackman's Valjean, I needed to see Crowe match that intensity. I needed to believe that he had a burning, unrelenting pursuit of justice that would rival Batman. That he was a man not to be messed with. That he would give up everything to accomplish his goal. But I never really felt it. Crowe holds too much back, to the point where I imagine that he might even feel a bit sheepish when watching his co-stars perform on the big screen. I can only think that Hooper just wasn't able to squeeze out of Russ everything that he wanted. I imagine it's very hard to get Russell Crowe to do anything that he doesn't want to do. Crowe is a frustration throughout, but is cushioned by a strong supporting cast, each of which have their memorable moments. Not the least of which is the comedic pairing of hideous confidence tricksters Thenardier and his wife, played by Sacha Baron Cohen and Helena Bonham Carter. We've seen similar performances from each of them in the past but their pairing is so inspired that any over familiarity is quickly forgiven. Master of the House is a highlight, as is their eventual exit. Les Mis also features some star turns by some wonderfully precocious children. The story sometimes lags and some of the character motivations get a little but silly (Jackman will be horrified by something one moment and singing its praises the next), but it's always played honestly and I really do respect that. I don't care how crazy things get in any film as long as the characters, at least, commit to it being real. Without that strong human connection it would have lost me, but Hooper continues to push to the end, creating, for me, a unique and satisfying experience. It's the only interpretation I know - I have zero to compare it to - but I left feeling uplifted and glad to have tried something new. Les Miserables won't please everyone ("Do you hear the people tweet? Tweeting a tweet of angry men!") but in a time of snarky and/or angst-ridden superheroes, this film contained the strongest performances I've seen in a while.